Deciding if your child is ready to be left home alone can be a tricky decision. I remember incrementally leaving Will and Molly alone while I popped out to get milk and increased the time as I felt they understood what to do in emergencies and my rules about opening the door. I always made sure they had my mobile phone number and Nanny’s and of course I never left them over night unless Grandma and Grandad were with them. I also remember my Mum popping up to Safeways in Streatham leaving myself and Melanie Barnet at home and we decided to make chips ! We were 15 but the chip pan caught alight and in my “wisdom” I threw cold water on the fat ! Thankfully Mum arrived home in time to save the polystyrene ceiling tiles! There are lots of things to think about. Plus, there are no hard and fast ‘home alone’ rules or laws because every child is different. Whether you or your child are comfortable with the idea will often depend on how mature and adaptable your child is – and we all know how much this can vary from child to child. Here is the advice from the NSPCC that will help you make up your mind about whether leaving your child home alone is a good idea. And if not, we’ve got some other useful ideas to help. 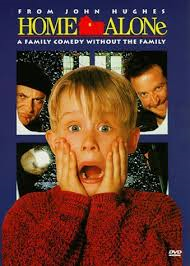 Strange as it may seem, there’s no set age for leaving children home alone. The law simply says that you shouldn’t leave a child alone if they’ll be at risk. There’s such a wide variation in the rate that children mature that it would be almost impossible to come up with a “one size fits all” law. Instead, the choice is left to parents. They know their children best and can use their own judgement. No one knows your child quite as well as you do – so use your knowledge of what they’re really like to answer these questions. This won’t give you a definite answer about whether the time is right to leave your child alone at home, but it’ll certainly give you plenty to think about. Can you imagine how they’d cope in an emergency like a power cut or a flooded bathroom? Would they know how to contact you or another family member or friend if they needed to? How would they feel about being left alone – pleased to be given the responsibility or scared by the thought of it? But remember, if you or your child are even the teeniest bit unsure about leaving them at home on their own, it’s always best to be on the safe side and arrange some other kind of care for them such as a babysitter or childminder. A Handful of Hope – ways to prevent a violent world. GCSE results day 2017: All you need to know.